Bean counters? The phrase is an expression of contempt, evoking images of dead-eyed money men without a shred of creativity or entrepre­neurialism in their cold, cold souls. But this year’s examination of the books of the top 40 UK PR agencies by accountants Kingston Smith reveals that it is not enough to have a swashbuckling new business record and dazzling creativity. If you want to make money in PR then someone has to count the beans. The study reveals that independent agencies – which tend to be bean counter-light – grew their gross income in 2014 by 10.5 per cent on average. 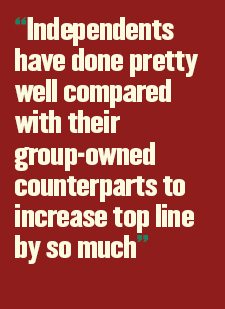 In contrast group-owned agencies, which are often disparaged as being managed by spreadsheet, grew their gross income by 6.5 per cent. Hurrah for independence. Unfortunately the tables also show that when it comes to making money from their new income, independents have much to learn. The operating profit achieved by group-owned agencies increased by 19 per cent whereas the profit achieved by independents fell by five per cent. This meant that the profit margins of independents fell to 10.5 per cent in 2014 while group-owned increased to 13.4 per cent. This was in part because independents were less ruthless at controlling costs. Although they pay lower salaries – employment costs per head averaged £62.7k compared with £67.7k for group-owned agencies – other costs per head were significantly higher (£31.2k compared with £24.3k). Esther Carder, the partner at Kingston Smith who compiled the report, says the conclusion has to be that the pursuit of volume is not necessarily the path to success. Not only were independents worse at controlling costs, they were worse at charging top dollar for their work. "Independent agencies have actually done pretty well compared with their group-owned counterparts to increase top line by so much. However given that average margins have red­uced at the independents it suggests that this may be at the expense of profitability and they have perhaps had to compromise on price to win the work," says Carder. The differing performance of independents and networks took place against a backdrop of solid but not spectacular overall industry growth. The top 40 companies generated an additional £45m, or eight per cent growth in gross income. Perhaps more significantly this led to an overall industry profit margin of 12.4 per cent, a half per cent improvement on last year’s figure of 11.9 per cent. "This year agencies managed to control their costs, which enabled them to post an overall improvement in operating profit," says Carder. In addition the industry may have been helped by the move away from retained relationships to project working, even though in recent years margins have been squeezed by this trend, suggests Carder: "It offers agencies the chance to examine their pricing structure. Projects offer a more rigorously scoped-out schedule of works and mean you are less likely to get stuck with loss-making retained business." The study shows that growth would have been stronger were it not for more than £7m written off to cover the cost of acquisitions. The largest single ‘impairment’, as accountants call it, was £4.7m on the books of Next Fifteen, followed by £1.3m at Bell Pottinger and £1.1m at CMGRP – which trades as Weber Shandwick – as they sought to write off the value of previous acquisitions. "These figures don’t represent a significant change from last year but they do show that the PR industry has become a reliably good performer within the marcoms sector," says Carder. "While margins have never quite hit the heights of 2009 (see graph below), they have never dipped below 10 per cent. 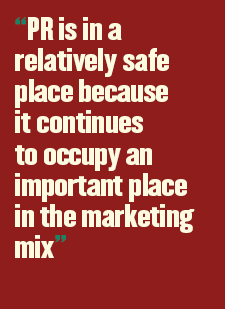 It shows that PR is in a relatively safe place because it continues to occupy an important place in the marketing mix." The PR sector certainly performed very well compared with other marketing services disciplines competing (and co-operating) for the client shilling. The ratio of operating profit to gross income – or profitability – was second only to the lucrative media management sector (12.4 per cent vs 12.8 per cent). 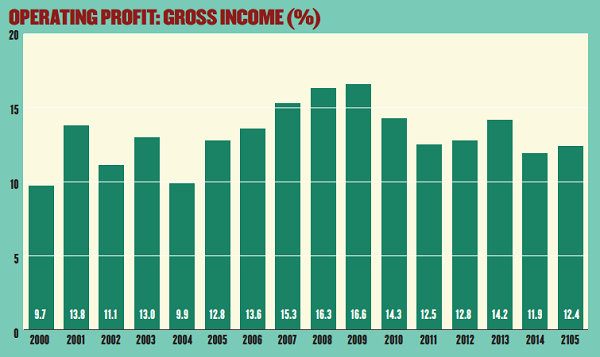 Growth of operating profits was second only to the booming design sector (see table below). In fact they are the only two sectors to have increased operating profits in absolute terms. "Not only have absolute profits gone up, so has profitability, which is a sign of an industry in good health," says Carder. In terms of size, the study shows that Next 15 is by far the biggest company in the sector with a turnover of £124m. Although it owns PR agencies including Text 100 and Lexis, it is not really a pure-play PR holding company. The biggest single PR company is predictably Edelman with a turnover of £67m, up an impressive 23 per cent on the year. Grayling did even better, showing growth of 34 per cent. Four Communications was up by 37 per cent and Team Spirit grew its business by 32 per cent. But the best performer by far was Portland, which increased its turnover by 73 per cent to £20m, leading to a 78 per cent rise in gross income and 172 per cent increase in operating profit. The report concludes that there is no single path to increased profitability: "While a number of agencies have achieved positive results by moving towards a fully integrated offering, others have reported positive results by focusing on their core skills." In a clue to the way that the industry as a whole might behave as the digital and social media revolutions become the new normal, Portland achieved this remarkable result by enhancing its client offer, says Carder: "It created a wider range of skill sets and ensured more integration across communications, which enabled the company to offer more and more services to its clients." But crucially as Portland offered more integration, it did this while sticking to its proverbial knitting. It maintained its focus on the business areas it understands – principally corporate and public affairs briefs. There was a similar story at Tulchan Communications and Four Communications. "We predict that a greater specialism, combined with a broader range of services, is likely to give consultancies the edge going forward," says Carder. While the overall picture is relatively rosy, the topline findings conceal real variation. 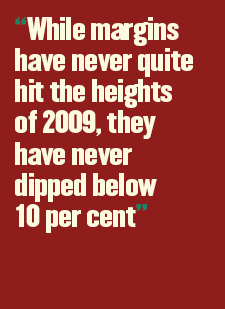 The report shows that just four of the top 40 suffered ­significant falls in income. The worst performer was Waggener Edstrom, which saw gross income drop 15 per cent from £5.4m to £4.6m. Huntsworth Health and Cake Media also performed badly while Fishburn presaged its recent announcement of a merger with FleishmanHillard with a 14 per cent fall in gross income. 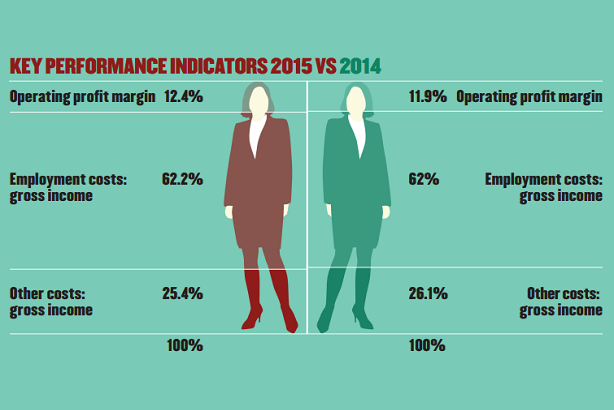 Perhaps surprisingly, the rewards of growth were shared a little more equitably this year. Employment costs of the companies surveyed rose by 8.1 per cent while ‘directors’ emoluments’ increased by only 1.2 per cent. It seems that senior people took a smaller slice of the pie. But that’s ok. If Carder’s analysis is correct, as long as the industry keeps on doing the right things, the pie will be much larger in the future.